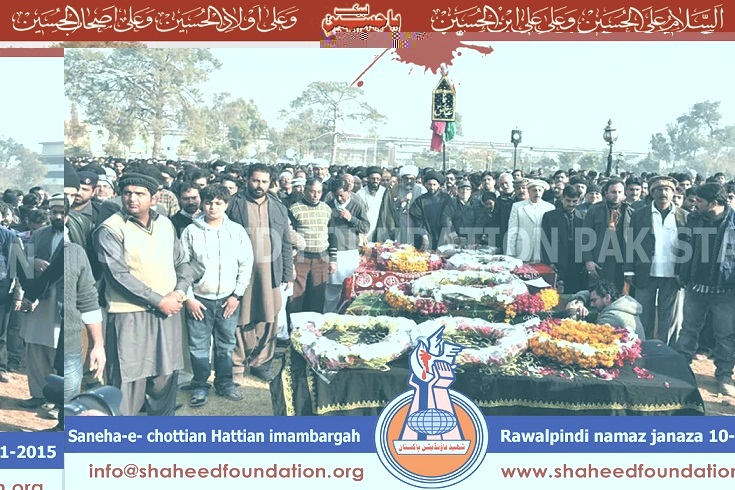 Please recite a Fateha for Shohada-e-Chattian Hattian Rawalpindi and all other Shohada-e-Millat-e-Jaffaria Pakistan. Another Injured of Chattin Hattian blast namely Noman Siddiqui s/o Muhammad Anwar Siddiqui embraced martyrdom. He was undertreatment in local hospital when he embraced martyrdom. Please recite a fateha for Shohada of Rawalpindi blast, Shohada-e-Millat-e-Jaffaria Pakistan and pray for early recovery of injured momineen. 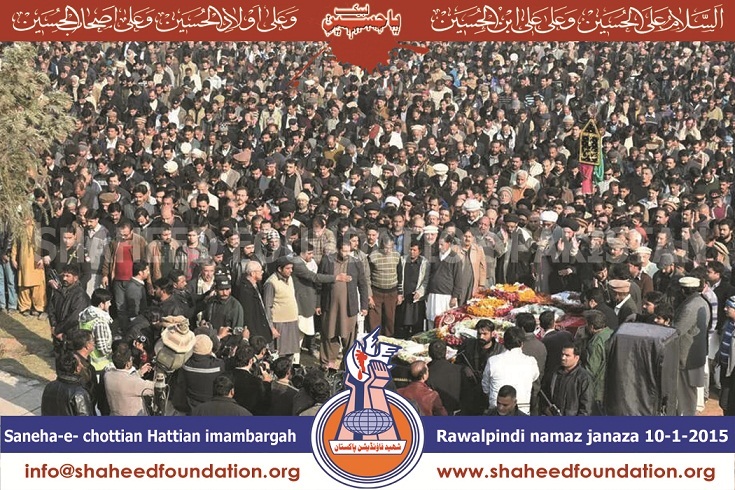 Namaz-e-Janaza congregation is scheduled to be held at Liaquat Bagh Rawalpindi. The martyrs bodies were earlier taken from chattian hattian Imambargah to the venue where the namaz-e-janaza was being scheduled. Burial will be held at Sakhi Shah Graveyard near Committee Chowk annexed where it will be taken in the form of a short distance procession . The traffic on Murree Road has been closed down to facilitate the procession. Casualties are feared as a powerful blast shook the vicinity of a celebratory congregation in the densely populated area of Rawalpindi ,the twin city of the federal capital. At the time of blast , momineen had converged to mark the Birthday of Rasool-e-Khuda [SAWW] and his noble great grand son Imam Jafar al- Sadiq [AS] . Early accounts suggest that a suspected bomber was intercepted by the vigilant volunteers at the entrance point ,averting a tragedy of higher magnitude . 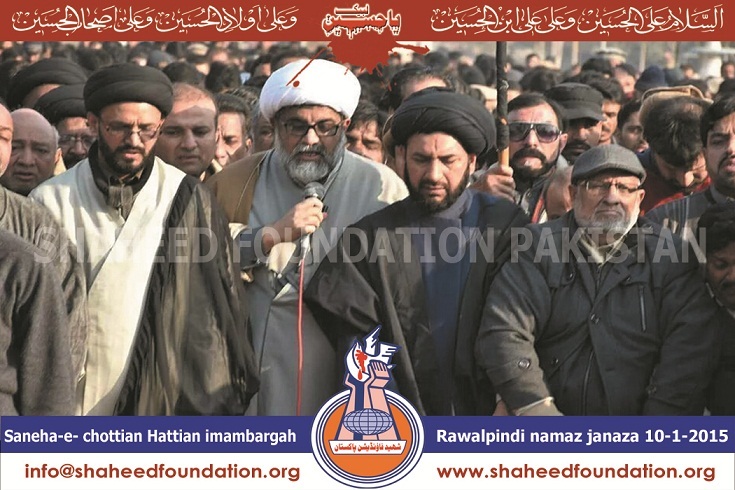 The Imambargah name is Abu Muhammad Imambargah as well and it was named after father of Shaheed Aun Muhammad Rizvi. It was a suicide blast and an attacker blew himself up at the gate of the Imam Bargah. 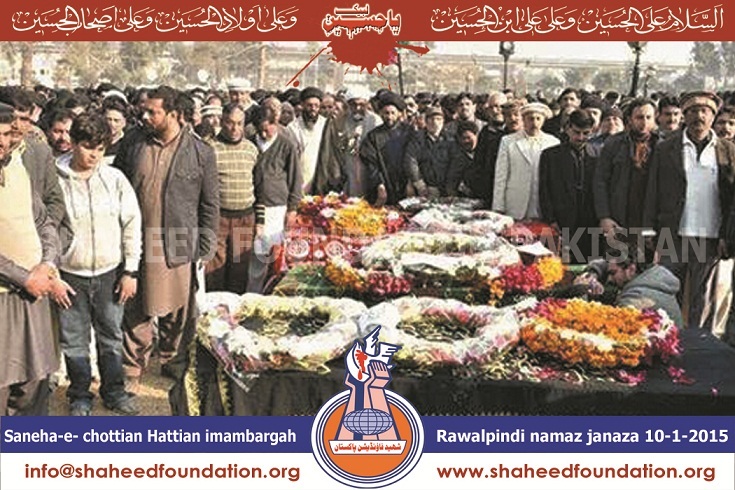 Charged scenes were witnessed right after the namaz-e-janaza and slogans were raised against takfiri terrorists.